And here is where I abandon all pretense of not making scrambled eggs. (For those of you too lazy to click, let me just share that this blog started as an attempt to motivate myself to cook something besides scrambled eggs for dinner all the time.) I made these for breakfast, but you? You who have made no promises about making scrambled eggs for dinner could certainly get away with serving these as a light supper, maybe drizzled with a nice olive oil and sprinkle of herbs, alongside a crisp salad. Sometimes you just need something simple. This is simple. Perfectly textured scrambled eggs, no added fat, negligible clean-up, 20 seconds of egg-whisking plus 20 seconds of cooking. Courtesy of that Genius Recipes feature I love from Food52. 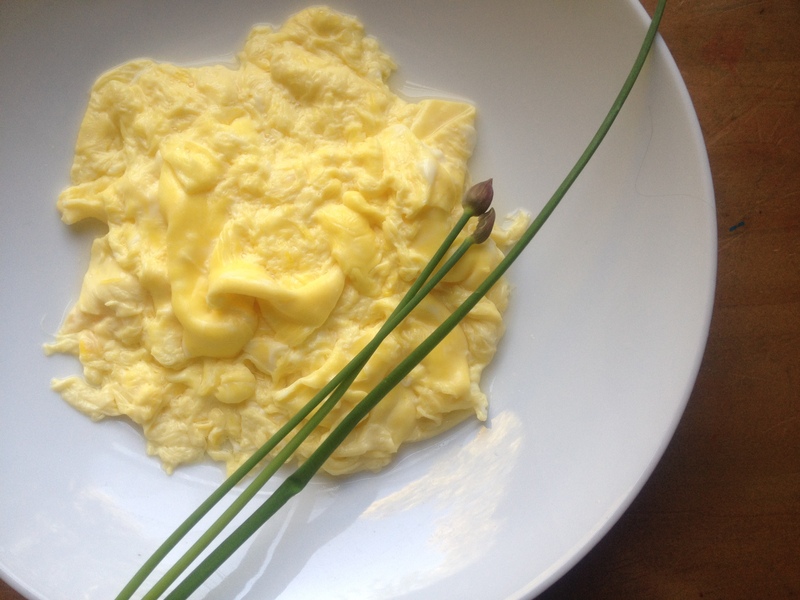 Poached Scrambled Eggs: Bring a pan of lightly salted water to a simmer. Whisk eggs for 20 seconds (2-4 should fit in a medium saucepan; you’d want a larger pot for more). Give the water a stir to create a whirlpool and pour in the eggs in a ribbon. They will swirl to cover the top of the water. Cover the pot for 20 seconds, then remove from the heat and drain gently into a colander. This entry was posted in Breakfast, Eggs, Feeding Kids, Food, My Favorite Recipes and tagged breakfast, cooking, eggs, family, food, kids, lifestyle, recipes, vegetarian on May 14, 2012 by emmycooks. Brilliance! Simple, clean, good, and yes – quick! I love eggs and they love me – I love this post! And I thought I’ve seen every way of cooking eggs. I’ve steamed eggs, deep fried eggs, and saw a post recently on 10 hour slow-baked eggs. And of course I’ve poached and scrambled eggs before, just not together! I love eggs, so am always welcome to more ideas, this is great. Deep fried eggs! I want to hear more about that, please. Just made this for breakfast (at lunchtime to be honest) and it was very nice. Thanks for the idea! That is really fascinating. I’ve never seen that technique before. Beautiful photo, too, with the chives. What a fantastic idea! I love it. Just love it. Looks terrific and I can’t wait to try it!